Sub-Antarctic islands are often teeming with wildlife. They are far enough south to benefit from the huge seasonal productivity of the Antarctic Ocean (that area of sea to the south of the Antarctic Convergence) but not so far south that they are wildlife-unfriendly by being ice-covered and with an extreme cold climate. 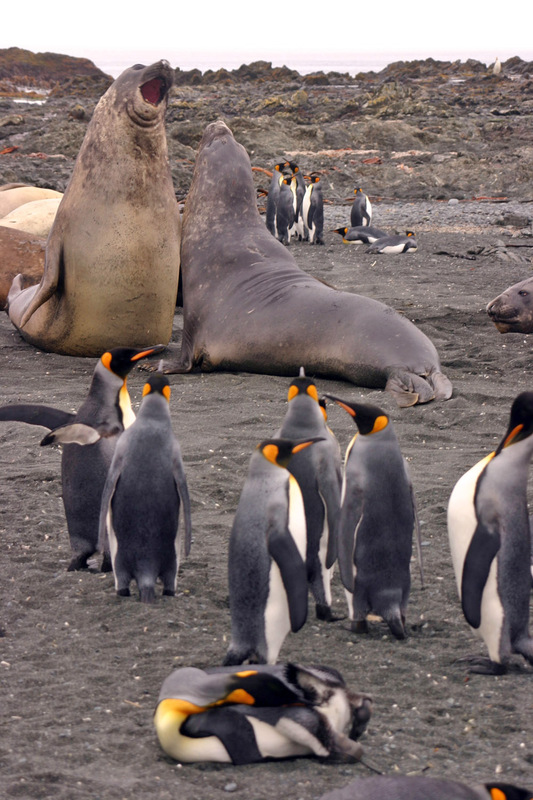 As a result the shallow and protected beaches in particular are often teeming with seals and penguins such as these Southern Elephant Seal males jousting for supremacy and these King Penguins who are far too regal and aloof to indulge in such roguish behaviour. Photo; © Mike Usher - Pictures from an icebreaker cruise to Eastern Antarctica.